Only a backup at Barcelona, but Jasper Cillessen could do well for the Blues after shining at Ajax and doing a strong job whenever called upon at the Nou Camp. Mundo Deportivo only recently linked the Dutchman with both Chelsea and Liverpool, but if Alisson ends up at Anfield then that surely means Stamford Bridge would be a more realistic destination for this shot-stopper. He may not be the biggest name out there, but Chelsea may soon be in a situation where they can’t afford to be too picky, and there does seem to be some interest in Cillessen. A stand-out performer for England at this summer’s World Cup, Jordan Pickford has impressed at Everton and could be ideal to fill this crucial void at Stamford Bridge. It remains to be seen if any top clubs are in for Pickford at the moment, but one imagines his impressive showing on the big stage means it’s only a matter of time. 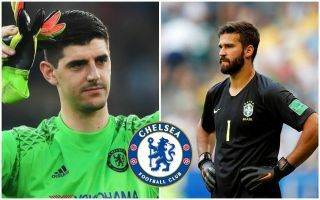 Chelsea look like they’re about to need a ‘keeper, so if other bigger names aren’t available, why not go for this big talent who’s already shown what he can do in the Premier League and at international level? A solid and consistent performer for Leicester City, Kasper Schmeichel also had a very impressive World Cup with Denmark, despite their exit in the last 16. Sky Sports suggest Schmeichel is on Chelsea’s radar, and he’d be far better than the other player being linked – Arsenal’s Petr Cech. Of this lot, Oblak is the dream option, but there are plenty of talented ‘keepers out there who could do a decent job of replacing Courtois this summer despite Alisson looking like heading for Liverpool instead.